Calcium silicate is used to insulate high-temperature pipes and equipment and for fire endurance applications. It is manufactured and sold in three different forms: preformed block, preformed pipe, and board. Today’s calcium silicate manufactured in North America is noted for its high compressive strength, corrosion-inhibiting properties, and high-temperature structural integrity. It can withstand continuous temperatures up to either 1,200°F (Type I, for pipe and block) or 1,700°F (Type II, fire endurance boards). Structural calcium silicate for applications requiring higher temperature resistance and greater strength is not covered in this article. Calcium silicate evolved about 1950 from earlier high-temperature thermal insulations: 85-percent magnesium carbonate and pure asbestos insulation. At first, calcium silicate insulation was typically reinforced with asbestos fibers. By the end of 1972, most North American manufacturers had switched to glass fiber, plant fibers, cotton linters, or rayon. Now North American–manufactured calcium silicate contains no asbestos. When industrial facilities started asbestos insulation abatement programs in the 1970s, asbestos-free calcium silicate was widely used as the replacement material on piping and equipment at oil refineries, petrochemical plants, power plants, steam distribution lines, and in other high-temperature applications requiring a high-strength insulation material. Today, there are only two manufacturing plants producing calcium silicate insulation in North America. Calcium silicate is made from amorphous silica, lime, reinforcing fibers, and other additives mixed with water in a batch-mixing tank to form a slurry. This slurry is pumped to the preheater, where it is heated to boiling and quickly poured into molds. After a few minutes, the material is removed as a wet and fragile solid. These formed pieces are placed into an indurator (a sort of steam pressure cooker) for several hours, where the chemical reaction takes place to form calcium silicate. The pieces are then placed into a drying oven. After drying, the pieces are trimmed, slit into two or more pieces, and packaged. The process is relatively low energy, as the highest temperature reached is only about 380°F. The molded, cured insulation material is essentially a crystalline formation with more air space than solid space (greater than 90 percent air). Millions of tiny air spaces separated by low-thermal-conductivity crystalline walls give calcium silicate its insulating characteristics. Very little infrared radiation is able to pass through it, so it is an effective high-temperature insulation material. American Society for Testing and Materials (ASTM) C533, “Standard Specification for Calcium Silicate Block and Pipe Thermal Insulation,” establishes minimum acceptable standards for both Types I and II. Type I is rated to a maximum-use temperature of 1,200°F and has a maximum density of either 15 pounds per cubic foot (lbs/ft3) or 22 lbs/ft3, whereas Type II is rated to 1,700°F and has a maximum density of 22 lbs/ft3. The as-manufactured compressive strength for both types is greater than 100 pounds per square inch (psi), at a 5-percent deformation, the highest of any nonstructural high-temperature insulation material in the ASTM materials specifications. The maximum linear shrinkage, after exposure to the maximum use temperature, is only 2 percent, and the flexural strength is greater than 50 psi for both types. Both the flame spread and smoke developed index are 0 per ASTM E84, since the material does not contribute to combustion. Max-imum allowable mass loss values in the ASTM specification are 20 percent and 40 percent after tumbling for 10 minutes and 20 minutes, respectively, demonstrating its resistance to breakage. Thermal conductivity and compressive strength are not adversely affected after testing for maximum use temperature, in accordance with ASTM C411. North American calcium silicate is formulated and manufactured to inhibit corrosion under insulation (CUI) on both stainless and carbon steel. This material is also classified as noncombustible per ASTM E136. Calcium silicate insulation is typically covered with a protective jacketing: conventional aluminum sheet, stainless steel sheet, polyvinyl chloride (PVC) sheet, glass cloth with weather barrier mastic, or a multi-ply laminate. To prevent water intrusion, a bead of sealant should be used on sheet metal jacketing overlaps. Calcium silicate is typically applied on high-temperature (greater than 250°F) pipe and equipment in industrial facilities, such as chemical plants, refineries, and steam electric power plants. Since it is a rigid material that has a relatively flat thermal conductivity curve, extremely high compressive strength, high flexural strength, a Class A rating for Flame Spread/Smoke Developed, and is noncombustible (ASTM E136), it is widely used in high-temperature, industrial applications subject to physical abuse. Due to its high compressive strength (greater than 100 psi), high flexural strength (greater than 50 psi), and resistance to damage from tumbling, plus its ability to maintain those properties over time up to its rated 1,200°F, calcium silicate can withstand considerable physical abuse without loss of insulating efficiency. 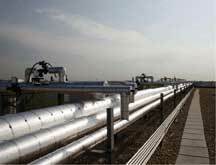 In addition, calcium silicate can withstand vibration induced by high-temperature steam flow around internal pipe obstructions, such as valve internals, measuring devices, and flow restriction orifices. Calcium silicate offers high-temperature structural integrity, high compressive strength, and corrosion inhibition. It can also be a major contributor to conservation. The energy used to manufacture a linear foot of this size calcium silicate is only about 154,000 British thermal units; the ratio of energy used to predicted energy saved is 575:1 for 1 year and 11,500:1 for 20 years. Readers who are interested in learning more about the insulation material featured here should visit the MTL Product Catalog or visit the NIA Membership Directory to find a manufacturer. 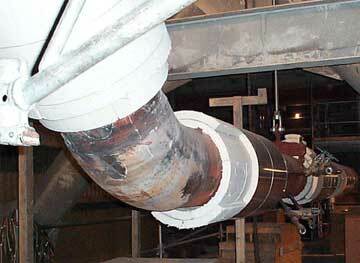 Calcium silicate being installed on a pipe at an industrial facility. Horizontal pipes, when insulated with calcium silicate, can withstand some foot traffic without sustaining severe damage.